When you click on the Drawing Hand icon on your desktop (shown below) the Drawing Hand helper application is launched. The Settings tab will display all of the available Display Modes for the screen saver. The recommended size is 1024x768 or something similar. 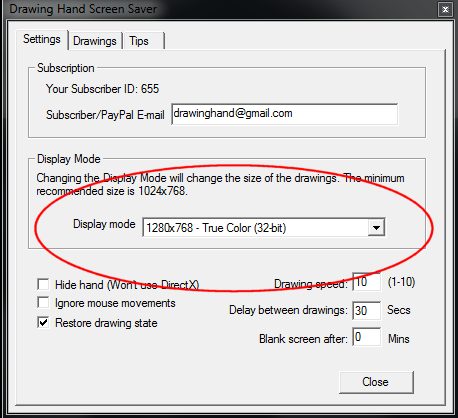 However, to play some of the smaller or larger drawings you might want to change the display mode. For the smaller drawings change the Display Mode to 800x600. For the largest drawings change it to 1400 or wider.